A day nursery is a childcare centre that cares for children from birth to four years old. Nursing encompasses autonomous and collaborative care of individuals of all ages, families, groups and communities, sick or well and in all settings. 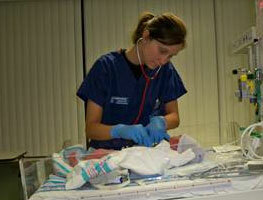 Nursing includes the promotion of health, prevention of illness, and the care of ill, disabled and dying people. Advocacy, promotion of a safe environment, research, participation in shaping health policy and in patient and health systems management, and education are also key nursing roles. A nurse is a healthcare professional who is focused on caring for individuals, families, and communities, ensuring that they attain, maintain, or recover optimal health and functioning. Nurses are capable of assessing, planning, implementing, and evaluating care independently of physicians, and they provide support from basic triage to emergency surgery.